Almighty God,by the glorious resurrection of Your Son, Jesus Christ, You destroyed death and brought life and immortality to light.Grant that we who have been raised with Him may abide in His presence and rejoice in the hope of eternal glory;through the same Jesus Christ, our Lord,who lives and reigns with You and the Holy Spirit,one God, now and forever. When the risen Lord visits the disciples at the Sea of Galilee, just as He said He would, Simon Peter and four fellow disciples are fishing, doing what they knew how to do. When Simon Peter heard that it was the Lord from the beloved disciple, he put on his outer garment, for he was “stripped for work”, and out of the boat, he threw himself into the sea. The Greek word for “stripped” is “gymnos”. Gymnos means naked. In ancient times, one competed in athletics naked. Peter was undressed, because he was working hard. He was probably hot and sweaty. Once again, Jesus caused a miraculous catch of fish and because Peter is naked, he puts on “his outer garment”, jumps into “the sea” to go to the Lord. He must have been quite soggy. 1 Corinthians 15:53 For this perishable body must put on the imperishable, and this mortal body must put on immortality. IN the verses above we are variously told also to put on the armor of light, put on love, compassionate hearts, etc, and in the Day of Resurrection we will be clothed in our “heavenly dwelling”. I will go out on limb here and say that the armor of light, the whole armor of God, putting on “love”, are all references to Baptism, and putting on Christ. We are encouraged to put on what we have been given: our Baptism into Christ. Peter and the disciples, sit on the sea shore and Jesus feeds them. In the next scene, He charges Peter to feed His sheep. The Lord feeds us Himself, His flesh and blood for the life of the world. Baptism is followed by Holy Communion. We can not go naked to the Lord and He clothed us in Himself as He clothed Adam and Eve in the Garden. We are not dressed for success, but for faithfulness. The verb “revealed” is used in the first and last verse of this Gospel lesson. The disciples are awed that Jesus arrives in Galilee. Revelation, or manifestation, epiphany is the mark of the end of world that has come upon us. When we put on our daily Baptism, the new self, we are dressed for and in the end of the world who is Christ, the Alpha and the Omega, the beginning and the end. Reread the texts above for a description of our Christening robe and how different it is from the styles of the world. We do not go out naked into the world or showing enough to sexually entice someone else. 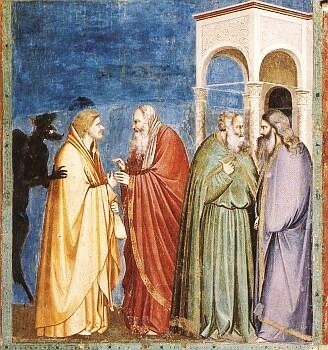 The Lord clothes us the shame of the Adamic nakedness as the Lord once clothed Adam and Eve (Genesis 3: 21). Adam and Eve’s garments were just for this life. 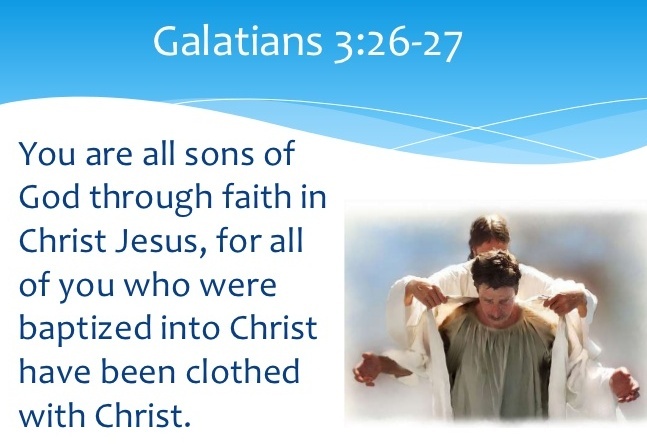 Clothed in Christ is His life for the new heavens and earth. And in the meantime, the Church will be different from the world as she is clothed in Christ and His armor of light and love. Introduction: The Eastern Orthodox Churches have a great custom by calling the first week of the Paschal (Easter) Season “Bright Week”. A great way to begin the 50 Days of Pascha leading to Pentecost, as we look at what our risen Lord taught His Church for her life and mission into the world. Easter, like Christmas, is not only a day each, but a season each. In the Lutheran Church, we have midweek Lenten services but I think we should have midweek Paschal services in this bright season! Further, as Lent is time of preparation for seekers to be Baptized, then the Paschal Season is a time for the newly baptized, and the ‘oldly’ baptized as well, to be instructed in the Way of the Lord more fully. I forgot to post for Easter Monday, but if you would like to read Easter Monday in a previous posting, here is one such posting. Almighty God,through the resurrection of Your Son You have secured peace for our troubled consciences. Grant us this peace evermore that trusting in the merit of Your Son we may come at last to the perfect peace of heaven; through the same Jesus Christ, Your Son, our Lord, who lives and reigns with You and the Holy Spirit, one God, now and forever. Amen. When we distribute the Holy Communion, there are a couple ways of doing such, and one way is “continuous distribution“. People come forth in a line(s) to receive the Body and Blood while standing: continuous distribution. The Lord calls His Church to the continuous distribution of His Word for our repentance, strengthening and growth in faith, and service to one another. We do not live by bread alone but by every Word that proceeds from the mouth of God. We need His Word as Israel did manna. We can not time travel back to Golgotha, as this is impossible. Instead, the risen Lord in the power of the Holy Spirit gives us His Word today as today is the day of salvation because Christ is risen! He is risen, indeed! Alleluia! Congregations, churches, pastors, priests fret over the question: how do we attract new members? I have asked that question and that is more than a simple admission and more like a confession. Is it our choir? Our youth program? Our peppy service? Our warm and welcoming people? Our meals on wheels? etc. etc. etc. All those things can be fruit of the Gospel but they are not the Vine from whence comes the fruit. What is our “draw”? There is only one “draw” in the Church, for the life of His world and you in His new creation: Jesus Christ. It is written that our preaching is Christ and Him Crucified (1 Corinthians 1:22-24), not was. Holy Baptism is into His Crucifixion and Resurrection (Romans 6:2-4 ; Colossians 2:10-12 ), not “was”. Holy Communion is the preaching of the Lord’s Death (1 Corinthians 11:26) and is His Body and Blood from the self-same Body and Blood given unto death is our life, not “was”. The Cross stands at the center, radiating out, Christ Jesus embracing us in His forgiveness. No Cross, no Savior. No Cross, no resurrection. No Savior, no salvation. No Savior and the good works He prepared to be our way of life. If there is no preaching of Christ and Him crucified, then the preaching of human works follows in order to ‘gain’ salvation; then there is no grace and Christ died in vain. Our self-chosen works become a hollow spirituality. In the national hospice organization, a chaplain is a “spiritual/slash/existential therapist”! No law of God, then no Savior who fulfilled the Law. Evangelism is not only for those who have not heard of Christ, or those who have but have forgotten: it is for every Christian as we tend to forget and need His forgiveness and life day by day. I’m struck by how hollow American Christianity can be. I love that so many say that Jesus is Lord, but I wonder whether there’s a center, or whether the Easter bunny is hollow. The Lamb of God offers finally not an unblemished lamb, but his own flesh as heavenly food. American Christianity has no holy place. And we substitute our Founding Fathers for church fathers. We have no holy place, and we idolize the land of Israel. But there is a holy place, and it is not just a place of the spirit. It is a flesh and blood place, the place where our Lord feeds us with himself, his body and blood, in a holy of holies holier than any Old Testament priest could ever hope for. Why in the world would we hope to rebuild the temple? We just heard from the Epistle reading, Christ is with us, body and blood, wherever his Supper is celebrated. Notre Dame Cathedral has been called a “monument”, a national French monument. I don’t go to the Lincoln Memorial to worship. Yet, at Notre Dame Mass is said, confessions heard, people are baptized and the song of the Church goes on. Maybe, the secularists are telling us that Notre Dame is a monument to a dead idea; maybe that’s what’s being said. That’s sad. But it’s not a mere monument. From Notre Dame to this little temporary Sanctuary sanctified by the Word and the Holy Spirit in the Lord’s Baptized sons and daughters. Jesus was clear: He is the Temple, not made with human hands. Now, given that fact, the fact of our Lord’s bodily presence, we should act like it. We should sing, “Let all mortal flesh keep silence, and with fear and trembling stand.” Our Lord comes to us, every week, wherever the Supper is rightly celebrated. Let’s celebrate that. This sermon, Good Friday Meditations, Holy Saturday and Easter Sunday sermons will reflect on the Questions from the Passion. IN this evening of the Lord’s Supper, when he said that one of you shall betray Me. The disciples asked: Is it I, Lord? In Da Vince’s famous painting, the Last Supper depicts this moment. Is it I, Lord, for whom You took frail flesh, from the womb of Your Mother, and died for us? Is it I, Lord, for whom You preached, and taught the Word of God as the Word made flesh for us and salvation? Is it I, Lord, for whom You said from the Cross, Father, forgive them for they know not what they do. Is it I, Lord, for whom it can be said, My sins crucified Thee. Is it I, Lord, from whom You gave me my brothers and sisters in You, my Lord and my brother to encourage one another as we see Your Day approaching? Is it I, Lord, that I should kneel in service to my brothers and neighbors? Is it I, Lord, for whom You washed me in Holy Baptism and made Your own to be built as living stones into a spiritual house, to be a holy priesthood, to offer spiritual sacrifices acceptable to God through Jesus Christ? Is it I, Lord, for whom You gave the Church the Office of the Keys for forgiving and binding my sins? Is it I, Lord, for whom You give your Body and Blood in this Holy Supper? And as St. Paul said, whenever we do as our Lord commanded in remembrance of him, we proclaim his death until he comes again. So it is, word and flesh belong together, and in our spiritualized and gnostic world, there is so much more we need to say and even more to pray. In 43 days, there is another important Thursday in the Church Year, Ascension Day. The two Thursdays are intimately connected in Jesus Christ because the ascended Lord, bodily and spiritually, deigns to be with us in His Supper, proclaiming His death until He comes again. The Crucified and Ascended Lord commands His Gospel be preached and He will be with us: This is my body, this is my blood. Lo, I am with you always even until the end of the age as He commanded baptism for all. When we confess and are forgiven, then as He said, Where two or three are gathered together in My Name, there I am. He draws us forth by His Body and Blood and by the same draws forth the toxins in body and soul in joyful repentance and sends us forth to proclaim the deeds of Him who called us out of darkness into His most marvelous light. In the Name of the Father and of the Son and of the Holy Spirit. Amen. “24 A dispute also arose among them, as to which of them was to be regarded as the greatest. 25 And he said to them, “The kings of the Gentiles exercise lordship over them, and those in authority over them are called benefactors. 26 But not so with you. Rather, let the greatest among you become as the youngest, and the leader as one who serves.27 For who is the greater, one who reclines at table or one who serves? Is it not the one who reclines at table? But I am among you as the one who serves.” He is still with us as One Who serves as He is risen! The two sets of readings for this holy day are about the vertical and horizontal dimension of the Holy Communion of the Church: kneeling to receive the Sacrament of the Altar and kneeling to wash each other’s feet. In many of the icons of the Lord washing Peter’s feet, Peter has his hand to his forehead as if he saying, “Oh, my!” (see the image above!). We might say, I’ll kneel to no man! I’m too proud and yet when I am sick or down, I am so glad when a friend in Christ is there to serve me in knelt-felt Christ-like love. Here is the Lord who knelt to all men to save us from our selves lost in sin and death. This is the Lord God who knelt to wash His disciples feet, His creatures’ feet. The Lord who knelt to feed us His Body and Blood. The Lord who knelt in prayer. Can we do any less? He calls us to Himself as His kneeling Church.